It isn’t often that we get to dig into our personal Walt Disney World photo archives, but today is one of those days. 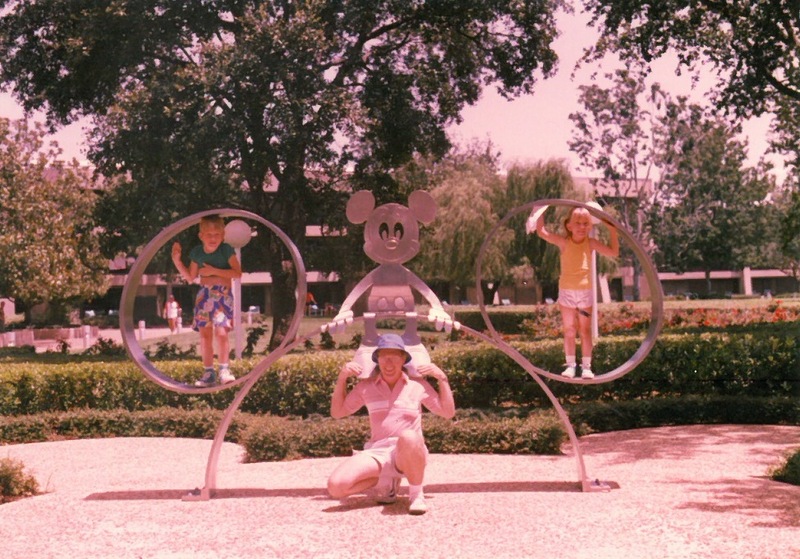 I’ve written before how much my sister and I used to enjoy taking a trip from Fort Wilderness over to the Contemporary Resort. Mostly it was so that we could run amuck in the Fiesta Fun Center for hours on end, but we also loved to climb on the Mickey sculpture just outside of the main tower. Heck, even my dad liked to get in on the action occasionally. By the way, I would like to not be blamed for my clothing choices in these photos. It was the 1980s, that’s my only defense. Even looking at these now, I appear to have been trying to cover myself in one, while praying that this photo never sees the light of day in the other. What struck me, and the reason I pulled these out for today’s article, even with my own personal embarrassment on the line, was how much this sculpture has changed over the years. Here’s a more recent photo of the Mickey ears, taken in July of 2015. Here’s what stands out to me. The sculpture placement has changed. Originally it ran parallel to the North Garden Wings, seen in the background, but now it faces out over Bay Lake. The pad it is placed on, and how it is attached to that foundation, has also been changed. 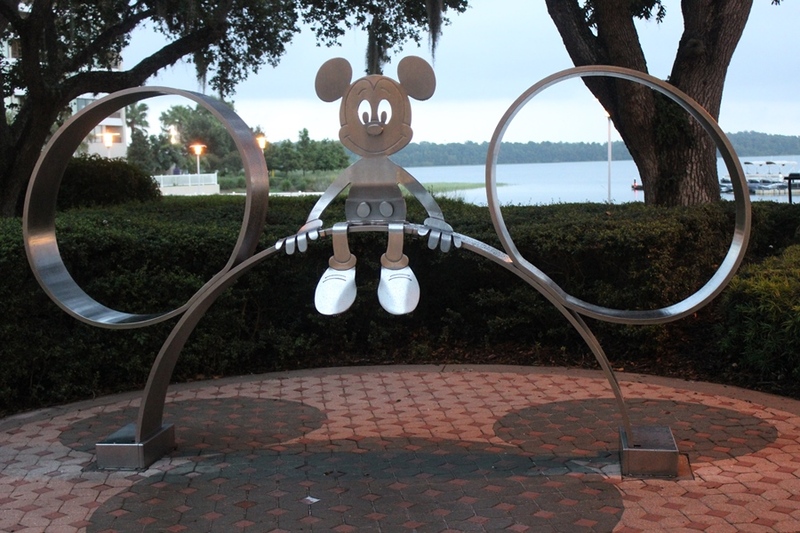 The original sculpture sat on a paved area that was Mickey shaped. However, the more recent picture shows a round pad with darkened pavers in the form of a Mickey underneath. Additionally, the metal framing isn’t simply bolted to the ground any longer, as there are box like footings at the two points of contact. Last, but certainly not least, are the people pictured here. The two in the ears have gotten much bigger, and that one holding up Mickey has gotten a bit older. 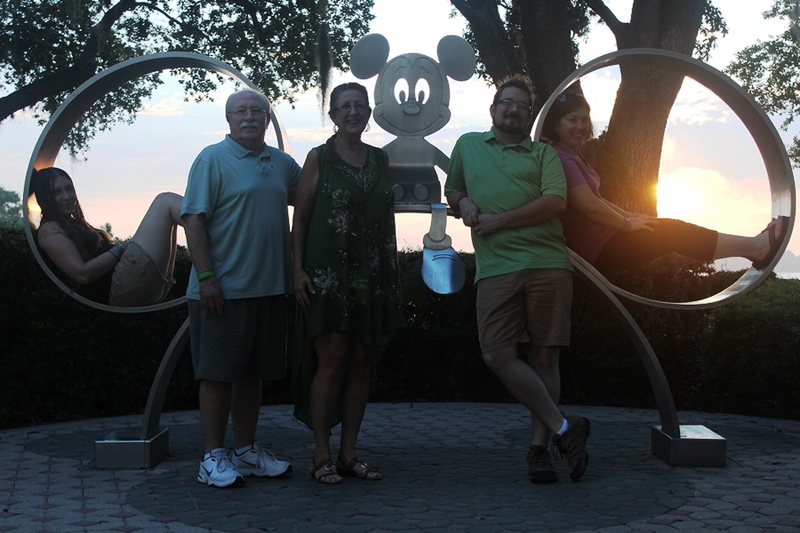 Oh, and the person who always seemed to have to hold the camera for pictures, can now step in front of the camera thanks to the handing stand now provided for the Mickey sculpture photo op. There’s also a new addition to the team, and I think we can all agree that she’s definitely a keeper. How we look at changes, in particular how we look at changes to the environments and stories of Walt Disney World, depend greatly upon what perspective we carry with us. 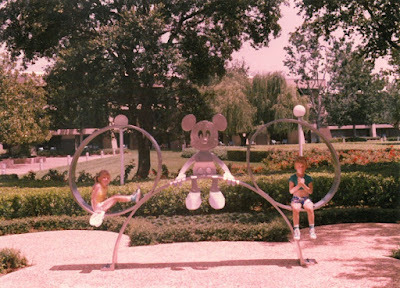 I can’t say whether I prefer the old set up of the Contemporary’s sculpture or the new staging. For some, they’ve only ever seen it one way or the other, and that informs how they feel about the sculpture. I am happy that I’m able to document the changes when they occur, and that I can still take a motor launch over to the Contemporary. Except these days it’s usually for the photo op and to grab a bite to eat.